I call December "Hell Month" because one of my 2 jobs in retail. Its supposed to be the "guaranteed grocery money" job, instead it dominates the month and keeps me from doing my other job and pretty much everything else. So, I'll apologize in advance for the sporatic posts. All that said, I've decided to concentrate on the Apostles of Quetza. The plan is to build the minis I need for the overall force. So, I need to fill out the tactical squad, see what I need for the terminators I have started and go from there. For the tactical squad, I have a sergeant... so I need 9 guys. I started with 2 Heavy Weapons options. Here they are so far. 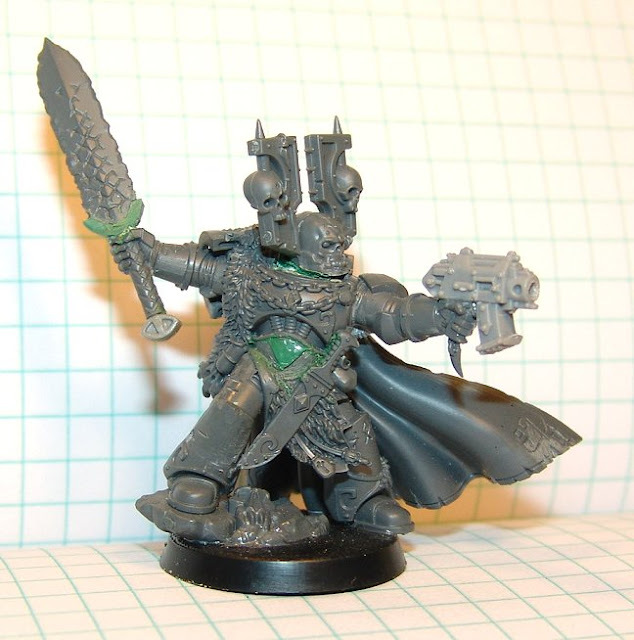 The plasma gunner is from the Dark Vengeance set. The Missile launcher has been around for a while and is one of many marines I have desperate to be repurposed. The Terminator Squad needed a sergeant, so here's what I have so far. Hand crafter powersword, in progress. There is still some sculpting to be done. His lower half is from a Space Wolf. I've trimmed up the wolf skulls and will be sculpting them into jaguar skulls. That's it for now. Progress is likely to be slow, but the nice thing about building is I can go into the hobby room for an hour or two and get something actually done, since I won't have several hours to concentrate on painting until January. Also picked up a GREAT book on Meso-American cultures. I've been studying them on an off since college, though usually from an art point of view. The more I read, the more I begin to build an uncharacteristically serious background story for the Apostles of Quetza, I knew about the blood sacrifice, but the flaying and wearing of skins along with rampant cannibalism was something I somehow missed. There may be a schism in the Chapters future(or past). 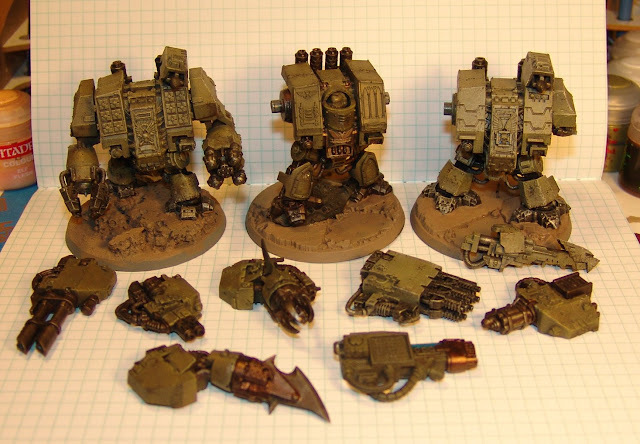 But more on them, the Tropico army and the rest after my Thanksgiving break. 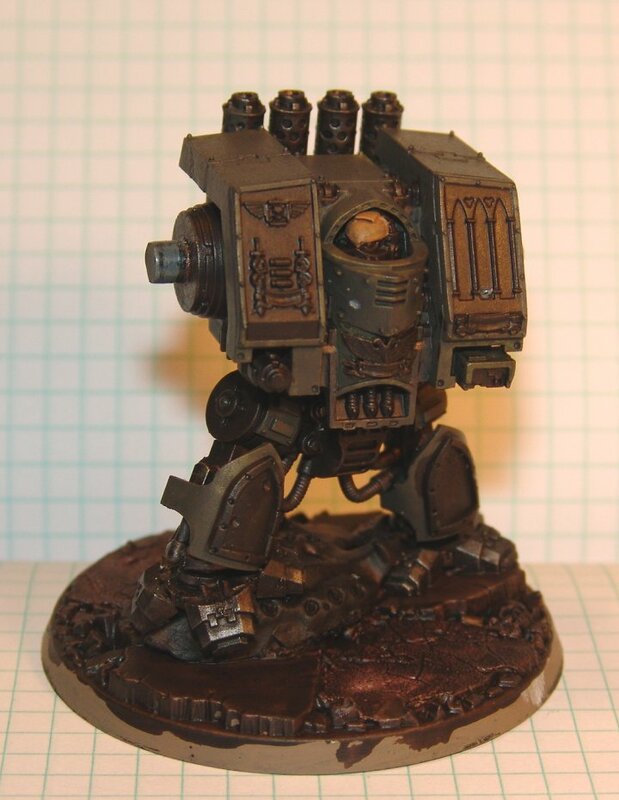 The Ironclad is finally finished. Revered Brother Orkin, known for his legendary bug killing abilities, now joins the other modles of Stike Force Ickarius, who sit idlly by in their foam trays waiting for the next eclipse/planetary alignment when I might actually play Warhammer 40K. One from slightly above to show off the pretty cool base. 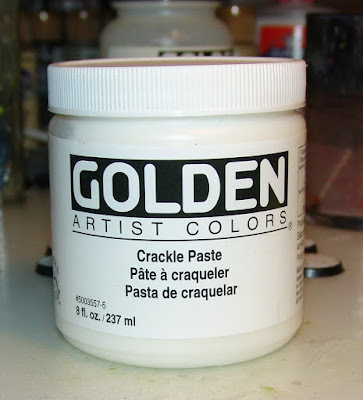 I LOVE crackle medium. As for El Presidente, he has his glasses all set (aviators) and a new thumb. His base is also done so I can finally glue him to his legs. Now, its just finishing up the uniform details. 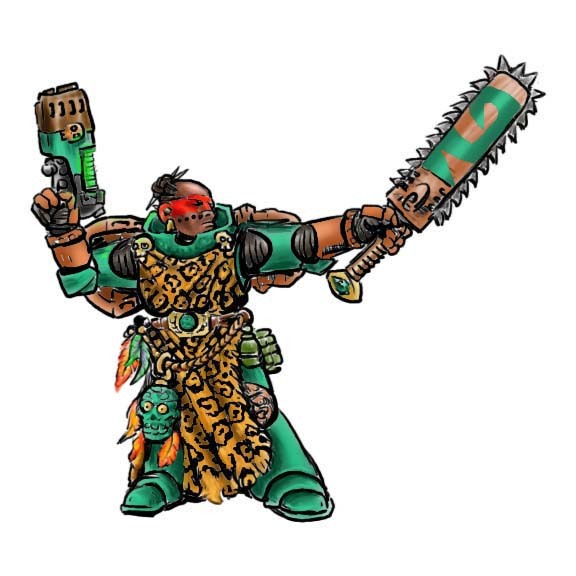 More painting coming, thought the holiday season will definitely impact the number of posts (job #2 is retail...ugh) I'm going to try to get the Apostles of Quetza sergeant and characters going as well as build the other 9 tactical marines for him. Its an allied force so 1 HQ, 1-2 troop (1 tactical... maybe 1 scout), 1 Elite (terminators) 1 FA and 1 HS- still deciding on the last 2. Any suggestions? That's all for now. Cheer's Yall! I'd like to give a thank you and general "Atta boy!" to Greggles (and everyone else involved) for putting together this fun blogger based challenge. Its been neat to see all the dreadnaughts and helped fill out my blog roll a bit with some new favorites, to which I'm still adding. 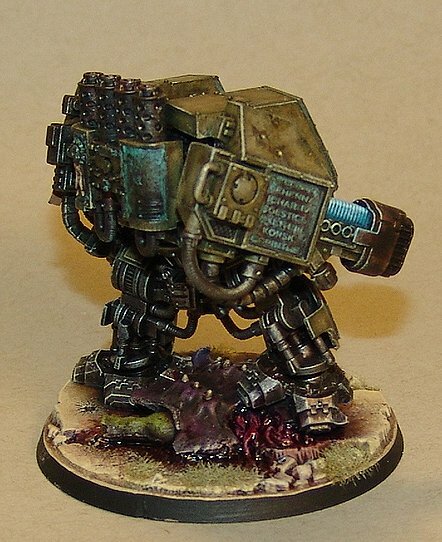 A special Thanks to Mr. Justin at Secret Weapons Miniatures for his support as well. 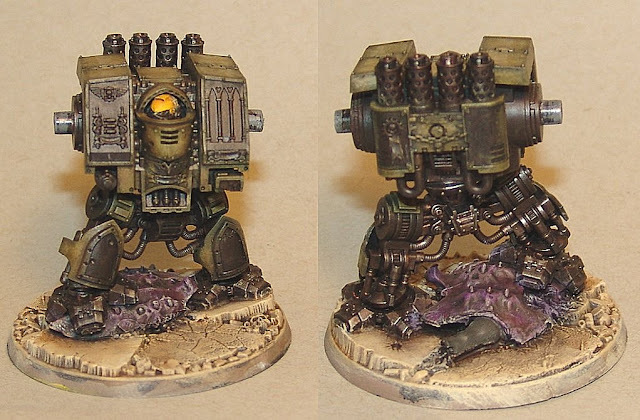 More paint on the Venerable Dreadnaught. 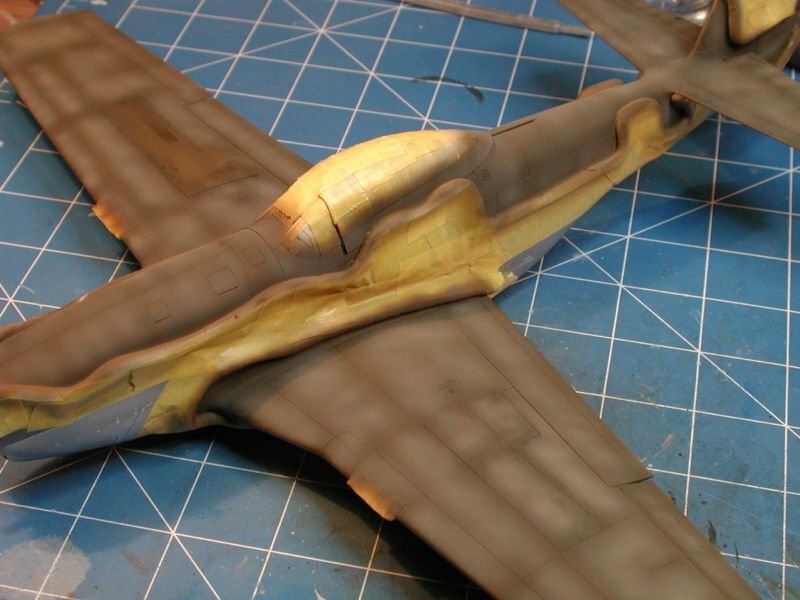 After looking at the P-51 picture a few more times I thought "Why not just go with the standard old school faded drab technique, but by hand?" So, I did. 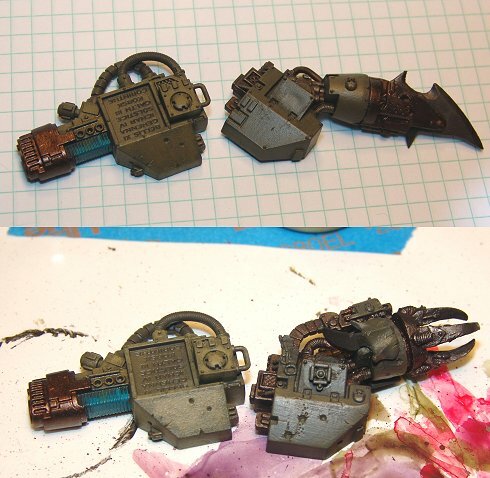 I mixed PP Battledress Green with some GW Pallid Witchflesh (which is basically a warm light grey), grabbed my old beat up drybrushes and went for it. 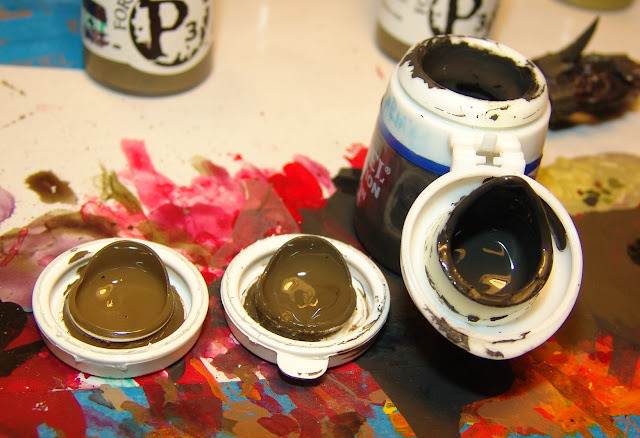 I mixed the paint on my pallete so I could go darker or lighter as needed. Then after adding the "faded" color, I gave it a thin coat of GW Althonian Camoshade to town the brownishness back toward green. 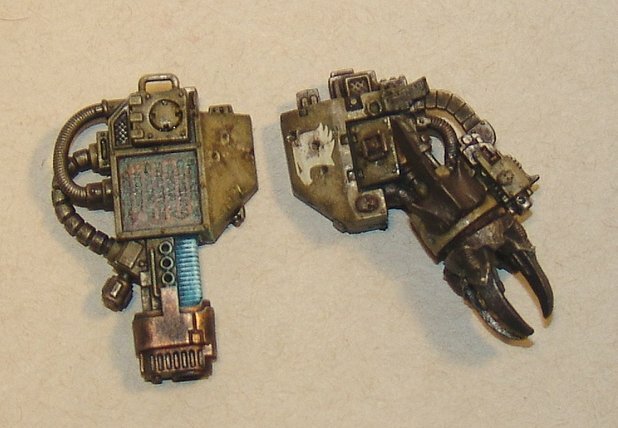 Its subtle, but the arm on the left has been washed, the arm on the right has not. You can see it better on this body picture. On the left, the center panel has been "faded" the others have the base color. On the right, is after the wash. When applying the colors I use a stippling technique. I have several older brushes of varied size, that the points went to hell on, so I cut the bristles roughly in half (picture the brushes original shape as a teardrop, cut that in half- basically) These brushes I use for dry brushing and stippling. I beat the hell out of them. They flare out, I trim a few errant hairs from time to time, but I've litterally had some of them for years. You can also use a sponge type brush, but it has to be fairly tiny for detailing and the sponges often put a bit too much paint down. I've been known to rub fresh paint off with my thumb a lot. My approach is that its better to build up several subtle layers than try to just slap the color on. I know... I Know Greggles....... one of these days I'll wrangle my wife into trying to shoot a video. Or at very least... a how too tutorial of sorts. Here's the product so far. The greens are done, now its time to work on all the metals, the bronze plaques and the squished bug parts on the base. Crackle Medium is just the coolest stuff. 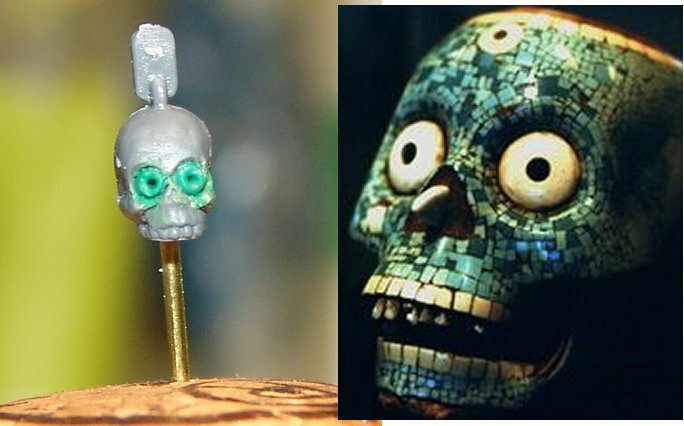 Best hobby discovery in my book since GW released the Shades line. Basic colors have been laid in. Eventually the base will have some static grass and maybe a few other things as well. And yes.... that is a yellow helmet. That's all for now. Probably have more in a couple days. 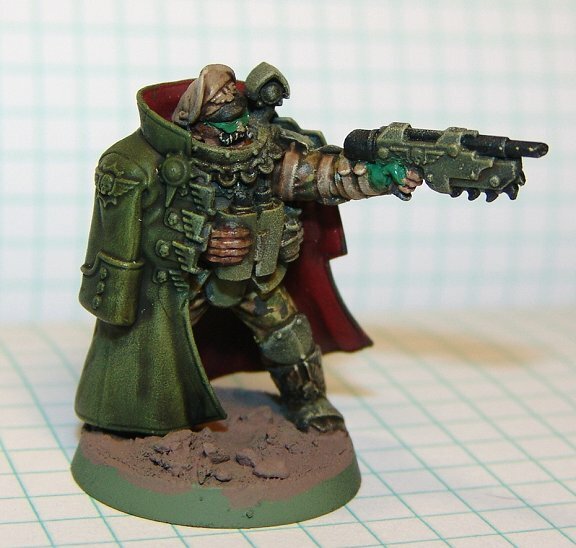 The base color is GW Chardonite Granite, then there are two shades of PP Battledress Green, one of which was mixed a bit darker and greener (can't remember with what though) and the other is straight. 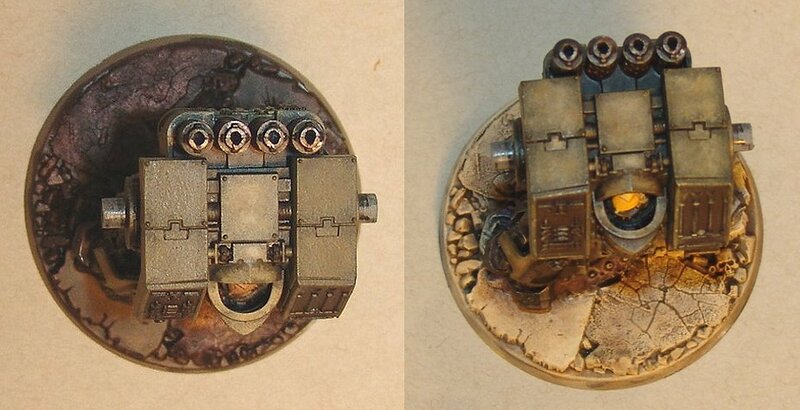 Basically, the technique from there is a mix of stippling and drybrushing, with the paint more faded in the center of the areas. And the bottom one is highlighted again with a mix off PP Battledress Green and GW Ogryn Camo. 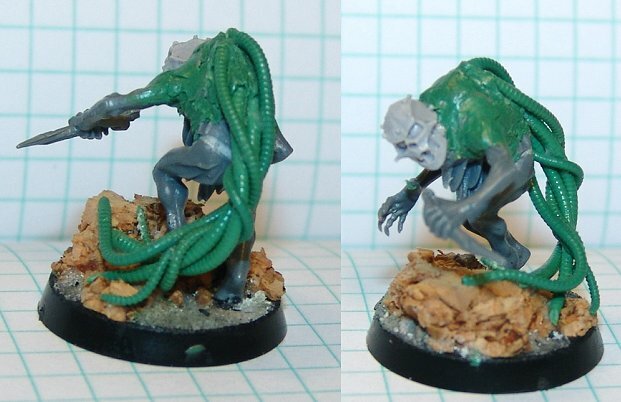 After that I got out my trusty GW Althonian Camoshade and did some washing. The end result isn't quite as severe as the P-51, but the tone matches my previously painted army pretty well and still has that worn, battle tested look. 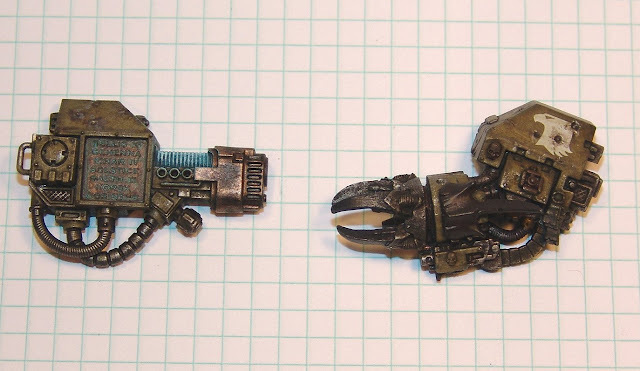 The Claw arm still needs its metal work, power claws and piddly details done yet. The pictures (and I took several) didn't really do the bronze battle plate on the side of the arm justice. 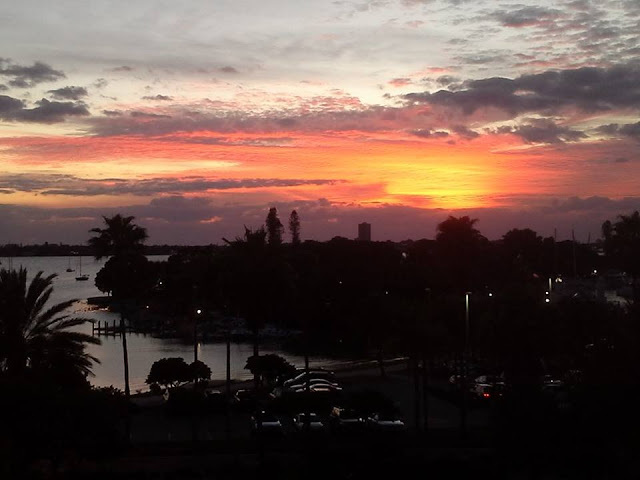 I'm hoping to get a better picture of that next time, because it came out really well. As for the rest of the Venerable Brother. He's got his base coats and detailing will start this weekend. I'm hoping to have him done so I have at least a week to work on the others. Optimistically, I should get 2 of the 3 done...MAaaaaaaaybe, I'll pull off all 3 before the end of the month. If not, it'll be the project until Thanksgiving break, which is pretty much my only holiday since I'll be working at Christmas time. Unless I win the Lotto. Historically, I do NOT complete painting challenges. Ever. Never, in fact. 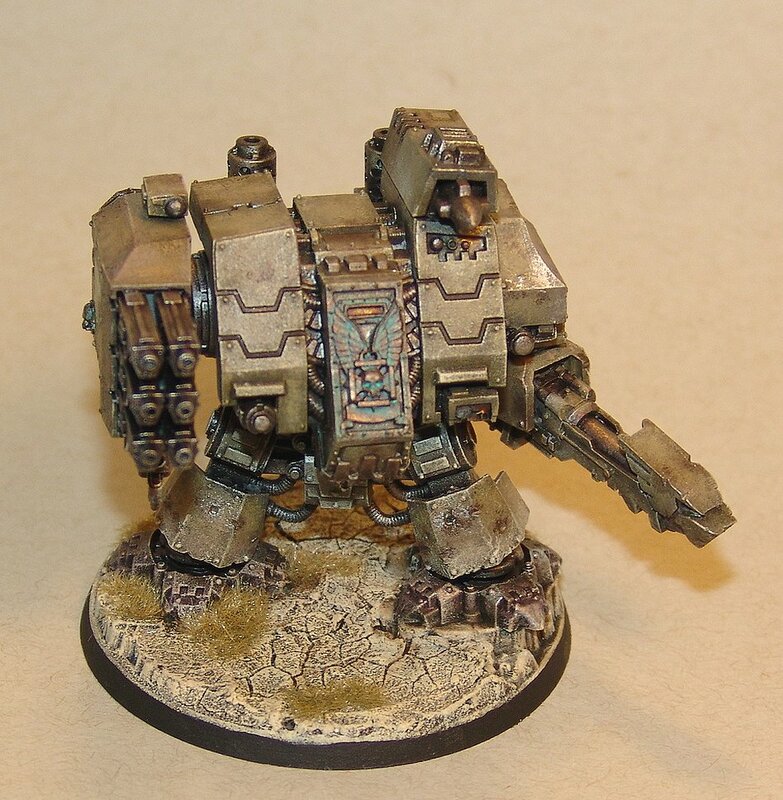 The along comes that pesky Greggles and he issues a "Paint a Dreadnaught" challenge. Ever the champion of possibly recuiting more faithful viewers, I decide.. why not? So, the debate began. 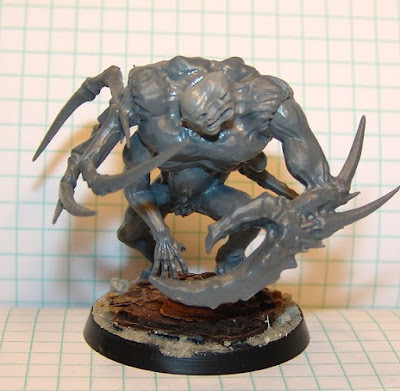 I have a starter set Hellbrute who needs amputaion and conversion. I have another Hellbrute in the box that is unbuilt. I began to think of what cool things I could do to turn them into Space Wolf/Khorny Wolf dreadnaughts. 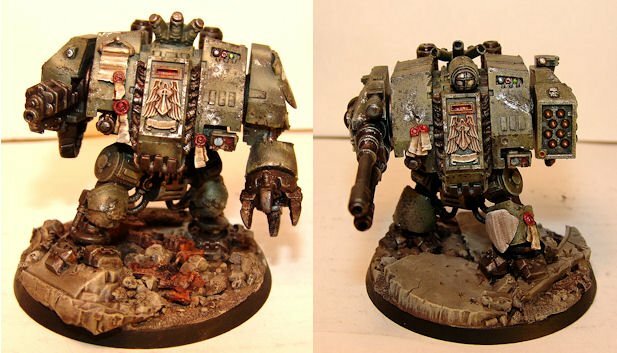 Realistically, were it a "build a Dreadnaught in a month challenge", I might do it. 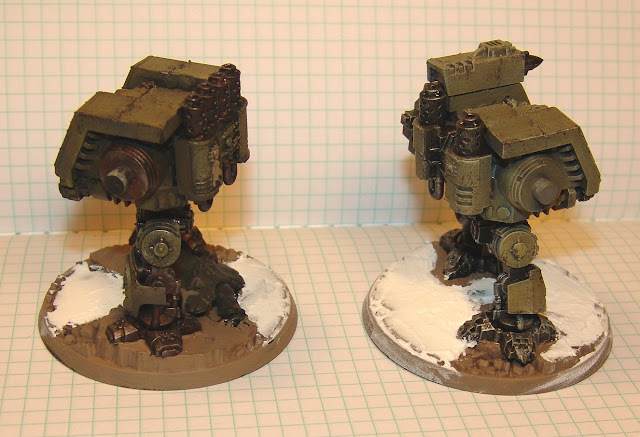 Then I remembered my Raptors army, sitting comfortably in its foam army containers (since I never play anymore). There was not 1, but 3 Dreadnaughts sitting in there unfinished. They only had undercoats on them. So, that will be my entry. Da Kunnin' Plan: To finish one, then possibly the other two, by months end. The possible complications? I am absolutely buried in artwork that I need to do and October thru December are very busy at my part-time out of the house job. But, if I could finish these 3, that would be HUGE. I'll settle for 1, but I'm shooting for all 3. I put these guys together in 2011, so I looked over everybody good and didn't see anything I wanted to add to or change (or could change... if I were building them from scratch, I'd make the poses more dynamic, but when these were built they were sort of hurried to compete in a league) The bases, could be added to, so I added my new favorite basing material, crackle paste to 2 of them. The 3rd, Revered Brother Rocky already has a cool base that raised him up a bit, since the old metal dreads are shorter than the new plastic ones. 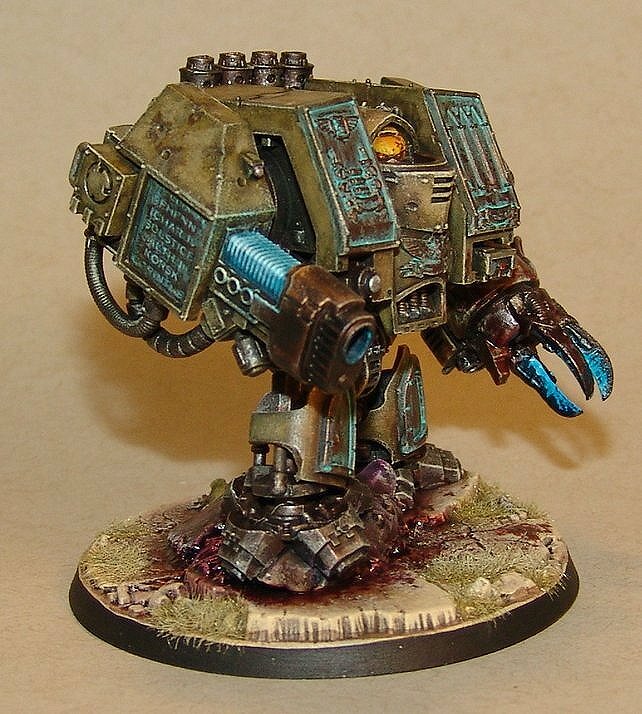 I'll start fleshing out the dark olive greens next and I have to decide if the Venerable Dread will get camoflage like the finished dreads I have for this army. Yeah... I said camoflage. Though it is subtle. This is an old picture, I'll get some better ones with the (hopefully) finished dreds above. That's all for now. Hope to have another update around the weekend. OH...HOLY CRAP and thank you all! 67,000 page views for my humble little hobby blog. I have a whole shelf of models to build yet, even if I never get to play so here's to another 67,000. Thanks again! 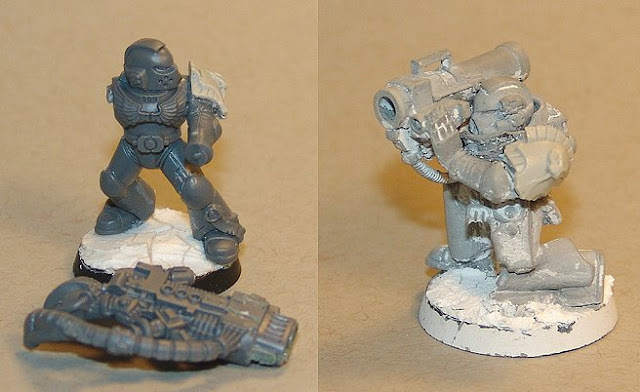 It all began when two members of the Bloody Arm of DOOooom cult took on a wounded Space Marine Captain. Somehow, they managed to inflict mortal damage, not without suffering the same. As they lay dying together, something stirred in the Warp and took pity on them and gave them new life. Thus Harvey and Brent lived again..... sort of. He's done. Now for paint. After a couple more piddly things to finish, I'm ready to do some painting again. Just some touch up remains to finish up El Presidente and the first Tropican trooper. I'll also be priming more Tropicans of the East Point Academy Rifle and Polo team. GO FLYING MANGOS! 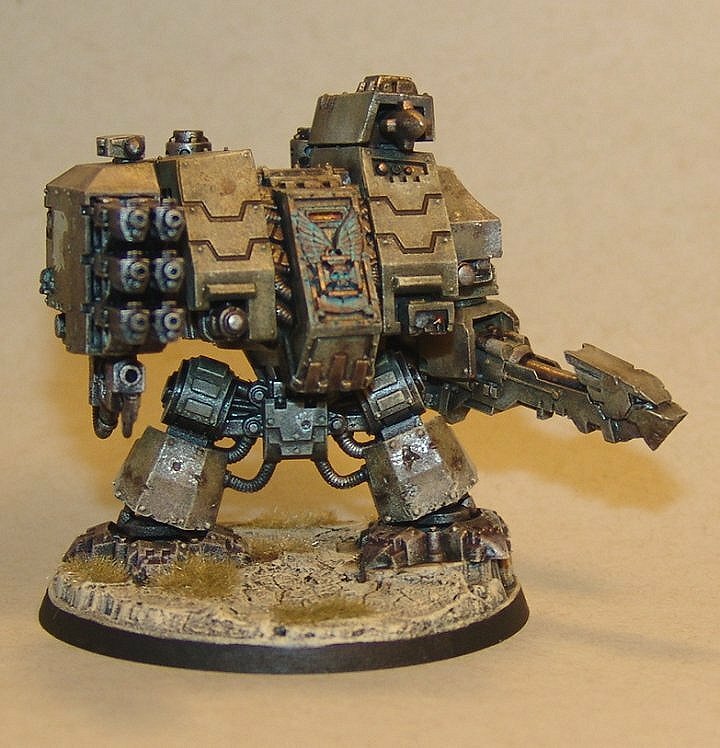 One thing I've always wanted to do is a force put together by an Inquisitor from various Space Marine chapters or their remnants. That's going to be part of the overall Loyalist force, which is the "Crixus Reclamation Force". We'll see more about them in comic from once I get ahead of all the other art work I'm swamped with at the moment. I don't have Inquisition rules (Yeah... 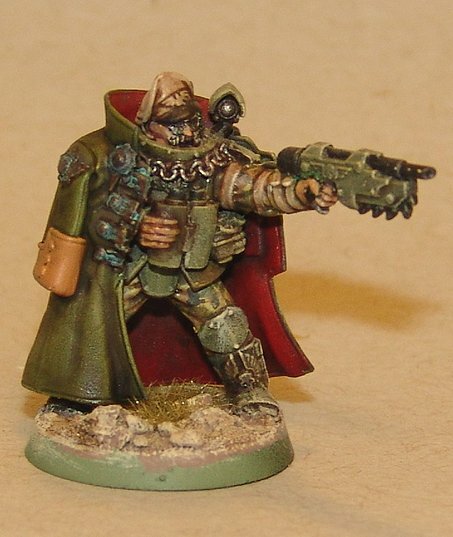 I know they are available) so I'm basically going to use Commisar Yarrick. 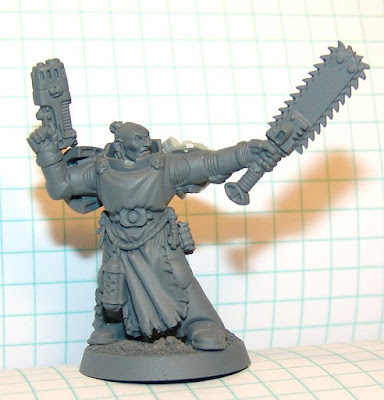 That way I can have him in the Guard army and have allied Space Marines. 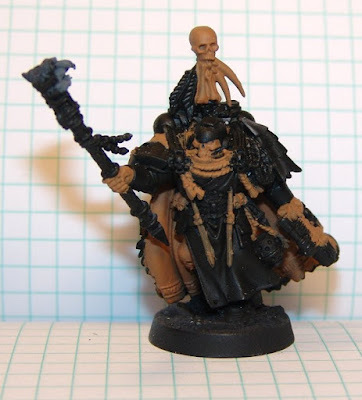 So, I've decided to do some rebasing and maybe a little touch up to this Inquisitor conversion I did a while back. 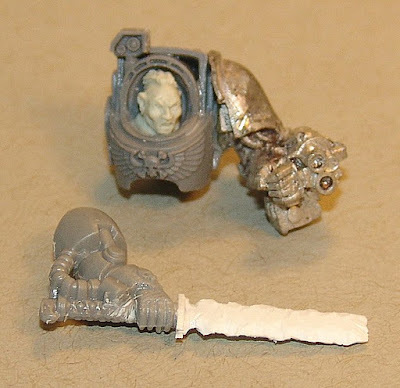 The cyber dog will be his power fist/claw and I'm thinking of some wierd little cherub/servo skull to be the storm bolter. But, its in progress. Hobby stuff coming in the next day or so. I've been doing a lot of clean up and priming, which don't really make for an exciting post. But I hope to finish up Harvey/Brent tomorrow night. From the Workbench: Is that Shingles? And.. what may be the finished product. Looks like a bad case of something.... ICK... shingles on steroids? At this point he's something I don't want to look at for a a day or two before I decide if I need to go after the legs. He is a bit top heavy. And in need of a topical cream, at the very least. The details on the Apostles of Quetza Sergeant are done. Everything else will be painted and he's got a brandy new base. 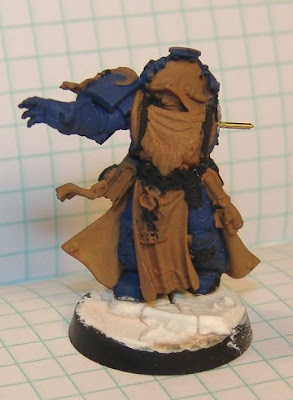 And so did the Librarian, though he still needs an arm and maybe a few more tweeks..
That's all for now. I may just do some painting soon, either way keep an eye open this weekend for the next post. Busy,busy,busy. 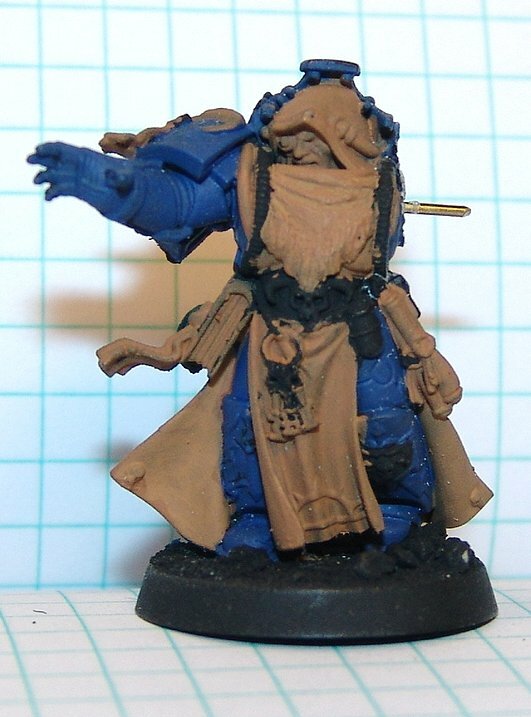 But, I did find some time to finish the color sketch of my Apostles of Quetza sergeant. 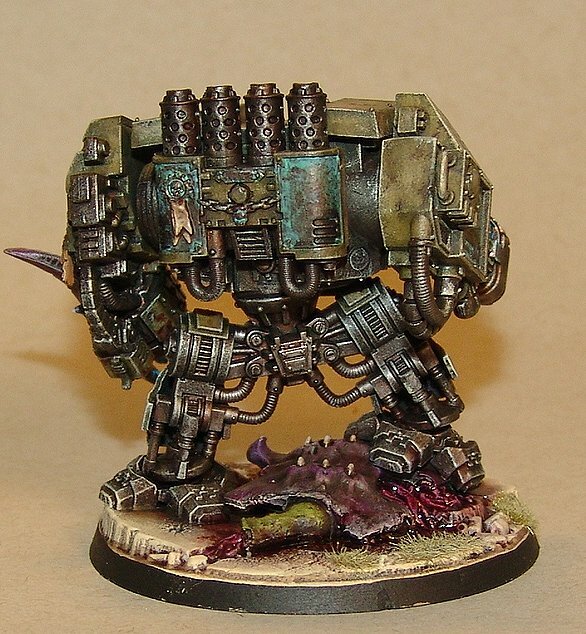 Its the basic idea for his color scheme, it may change when paint is involved. But basically, Jade Greens and Terracotta. 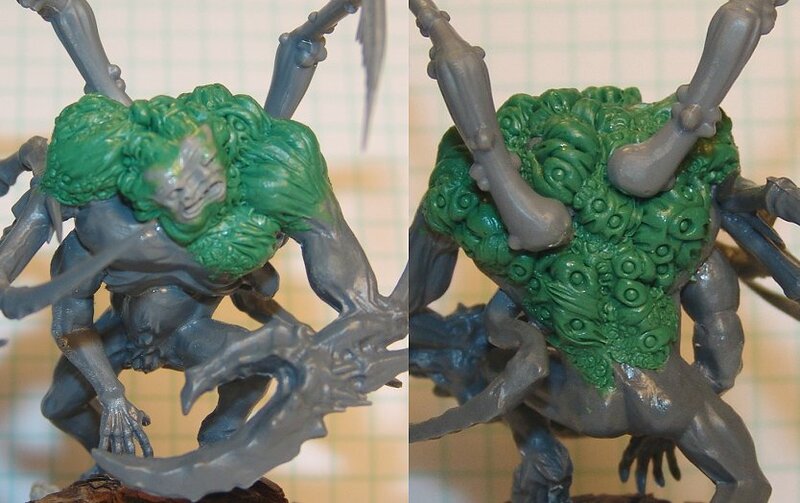 Also been sculpting away an Harvey/Brent the poor, unfortunate Chaos Spawn. I'll post some pics in a couple days, so I have more in-progress photos. Keep an eye open. A mixed bag of in-progress stuff. I get the feeling before I'm done, there will be a LOT of green on this guy. 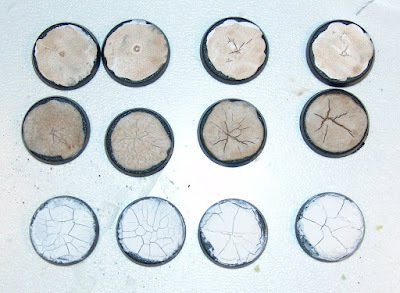 And here are the results of my basing with the Crackle Paste. Worth every penny. I sealed it with a couple coats of slightly thinned Matte Medium to make sure it got into the cracks. You can sand the stuff, but you'll want to give it another quick sealer afterwards. I've begun work on a jade skull for the belt of my Apostles of Quetza sergeant. The image on the right is the relative goal. I now have my hot little hands on the new Space Marine codex too. 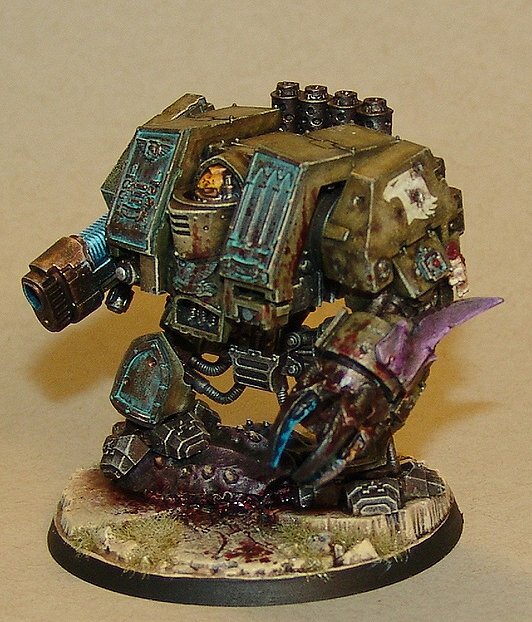 So, don't be suprised if you suddenly see my Raptor marines show up. 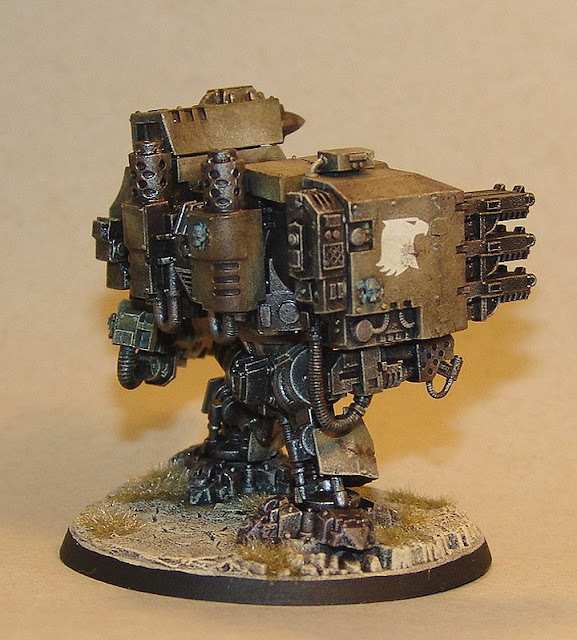 I need one more tactical squad for the Demi-company formation. The head is pinned in and I've got to do some sculpting to get it to mesh good, along with some power cords and other 40k ish stuff. Here's how the cracked mud/sand basing experiment went. I started with Acrylic Gesso ,Acrylic Modeling paste and Crackle medium. Just to see what happened. I did a 50/50 mix of each acrylic with the crackle medium and applied it to based. A light coat on the left, getting progressively thicker as you go right. I also added a little fine sand to the model paste/crackle mix. THEN.... I got my grubby little mitts on THIS STUFF! Doing the same thing on 4 bases, a light smear on the left to about a 1/8"+ thickness on the last one. After only about 6 hours of drying, you can see the results are just pretty damned awesome. 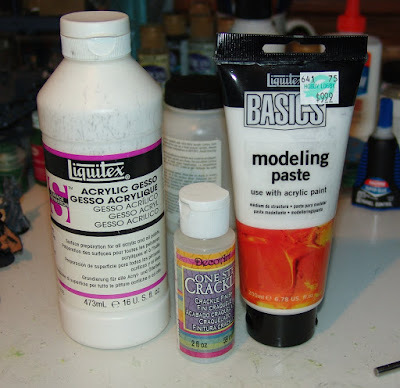 There's plenty of paste in that container for basing, since you don't need much. 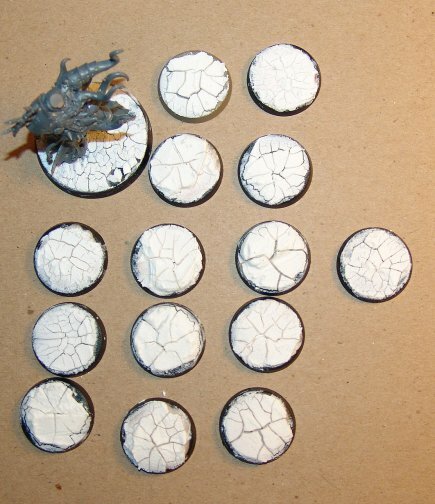 As long as you aren't doing terrain with it, its worth the money, considering the number of bases you can do with one container. I found it at Michael's in the art department and I think it was @$16-17. Definitely seems you get bigger cracks with more stuff. 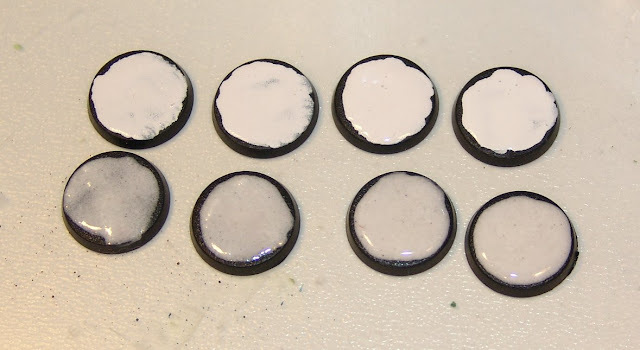 I'll be putting the crackle paste over the other bases, most likely. In other news, I picked up the new Marine Codex, finally. The one painted army I have (my Raptors Marine army) might be getting a few more guys so I can make the Demi-Company Formation... if I ever were to play. Its a pretty book. I'm glad I had a $10 off coupon though. More Tropico and other madness in the next post. Old Dinosaur learning new tricks. If any of you are graphically inclined in the digital arena, you may have Wacom or something like it. I've had mine for 6 years and, aside from dusting it occasionally, haven't used it. Until recently. If you checked out my link to the Dragons I've been doing for my wife's Kindergarten class, you can see I'm jumping back in with both feet into the digital arena. I'm the first one to admit I'm a dinosaur. I'm pretty happy with the way it came out. Its basically what I have planned for him. I think I'll even be coloring him in Photoshop to see if I like the colors I have in mind. And NOW... for a little experiment. Which I blame completely on Greggles and THIS POST at his blog. While I don't have the same materials, I got me Kunnin' Plan. 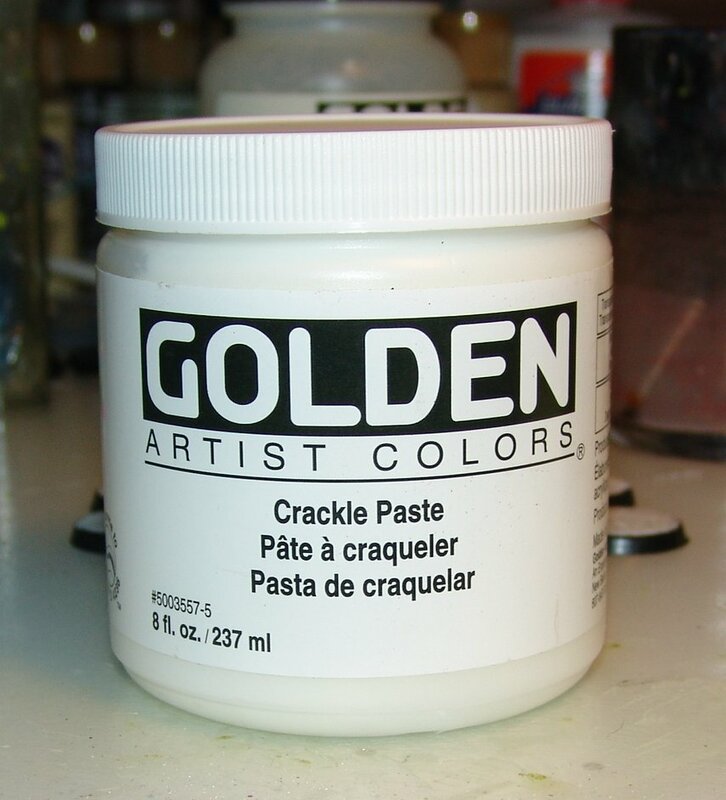 I'm going to mix Acrylic gesso with crackle for one base and Acrylic modeling paste with crackle on another and see what happens. The results .... next time. I've been working on artwork all week for my wife's Kindergarten class. If you'd like to see what I've been up to instead of working on models, CHECK IT OUT! Should be a hobby update around Sunday/Monday. Finally got some hobby time in and got several things going on. First, VIVA TROPICO! 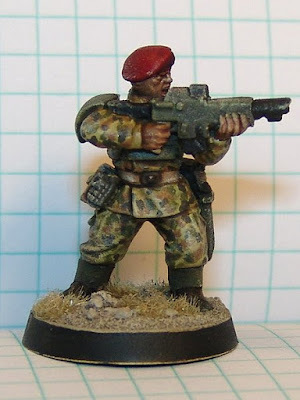 Here's the progress on the "test" Red Beret. Everything except the skin tones and unit markings/details are done. The camoflage looks like its terribly time consuming, but its actually a fairly quick process. As for El Presidente, he's underway, but I realized he was missing a thumb and some sunglasses. 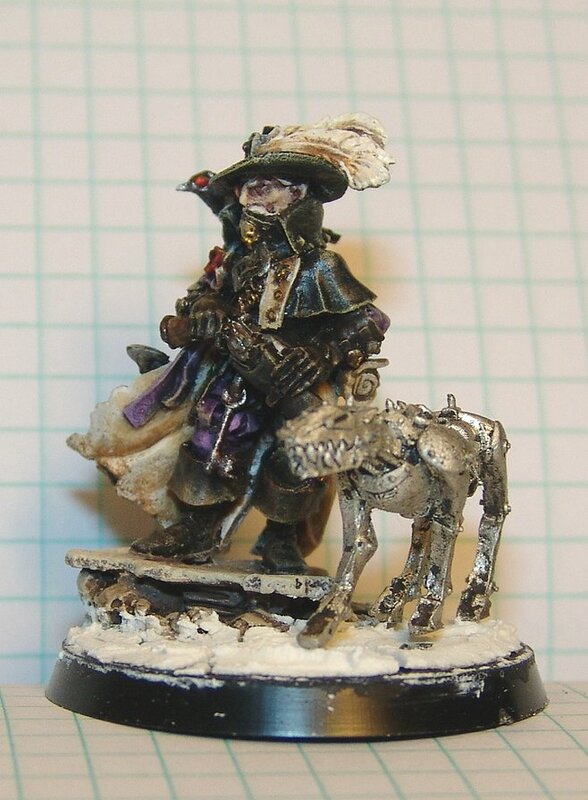 Lots of detailing to finish as well as the overcoat and hat. 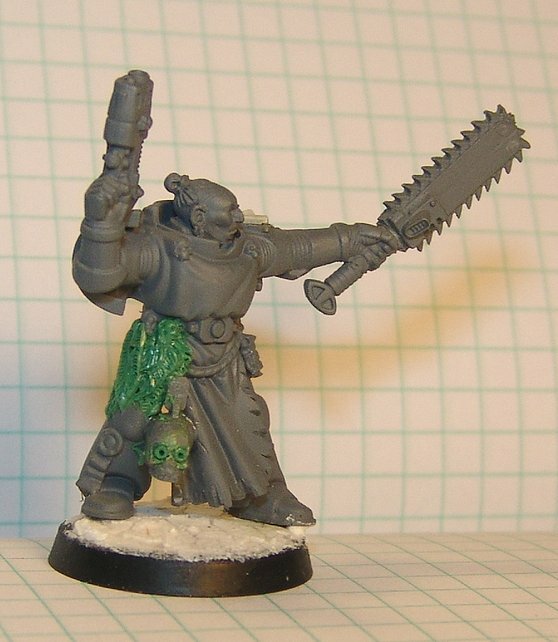 And some on the Librarian, who still needs an arm. Now we come to my Khorny Space Wolves... 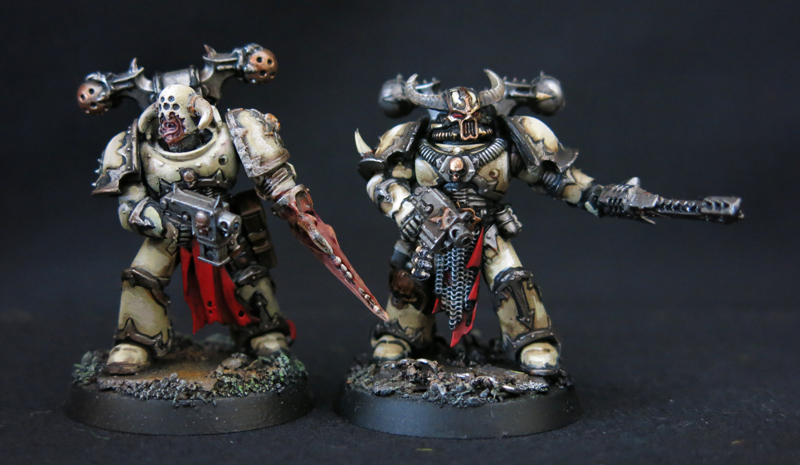 The Bloody Claws of Khorne. This is Ragnar Blackmane.... no, really. it is! 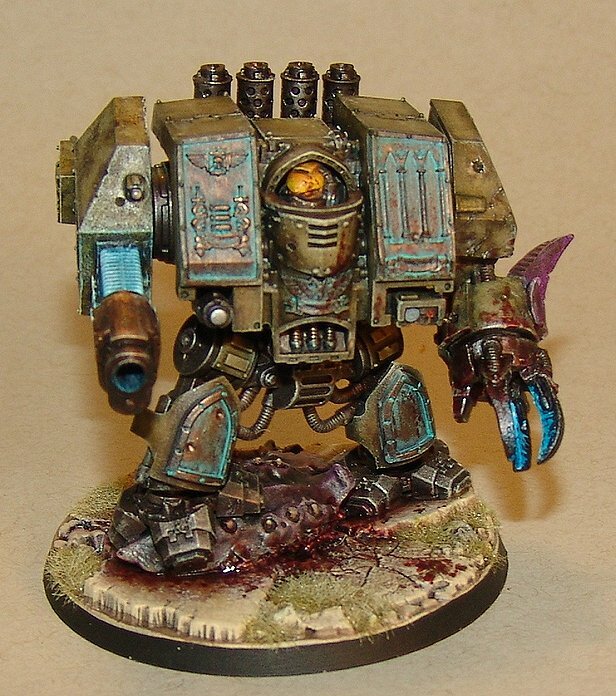 Or as the Plague Marines like to call him Ragnar Underbite. There is still some work to do on him. Mostly to find the happy medium between Chaos and Space Wolf. Details,details,details....its all in the details. Then we come to the Odds and Ends category. 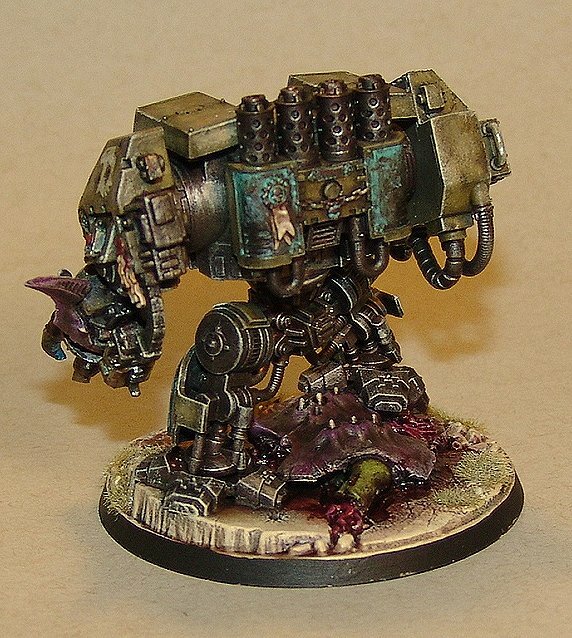 This guy, I think, will end up being a Vox Creep for my the Bloody 7th. Or something else. But, either way.... he's pretty cool so far. 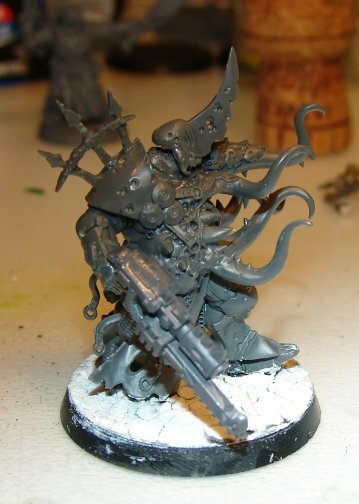 Possibly what my Sanctioned Psykers will look like. 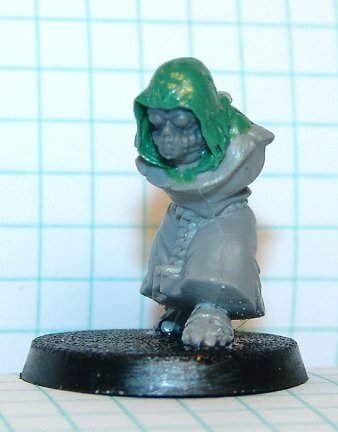 He's kind of a test model on the Plague Monk body. And this is Harvey.... and Brent. 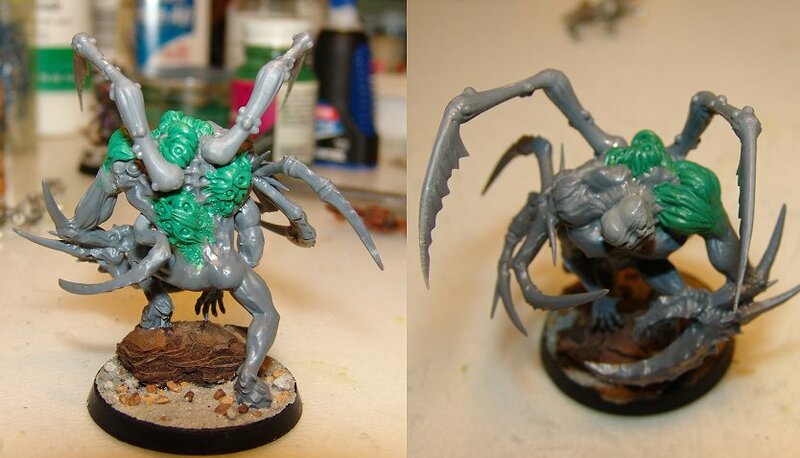 Because a Spawn with two heads (sort of) is better than a Spawn with one.... maybe. Still a bunch of gribbly greenstuff work to do on Harvey/Brent. There's likely to be all sorts of cool stuff going on on his back. I figured its good to have a spawn or two in case I ever play and somebody gets "blessed" for winning a challenge. That's all for now, gang. I'm making the last push to get stuff done for my wife's classroom, so the next few days I'll be drawing cartoon dragons. But hopefully I'll get in another update later in the week. Next week the "routine" begins again and updates should be more regular.... along with COMICS! So keep a weather eye!